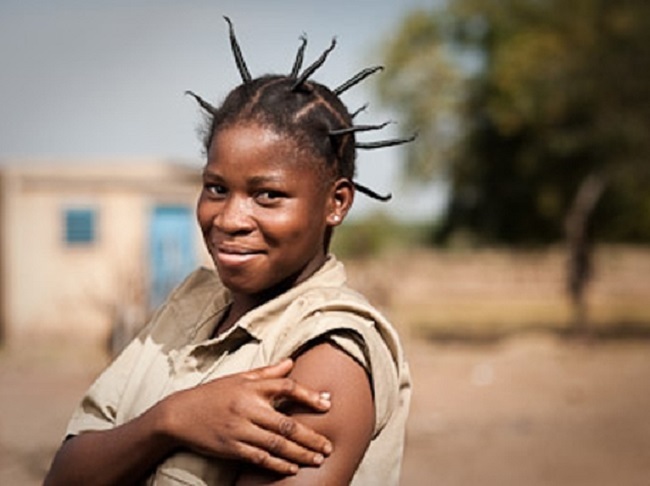 Edwinge Nana, 19, after vaccination in the village of Koubri. Edwinge’s little brother Charles died of meningitis at age 7. Negotiations, however, soon stalled. Two big companies were interested, but finally, after 18 months of negotiations, they said they couldn’t bring the price down below $2 a dose; the project’s target was ‘under 50 cents’. Discussions with another company, which owned technology needed to produce the vaccine, also collapsed, again over pricing. “There was just too big a gap,” says Tiffay. They describe what they did as setting up a kind of virtual pharmaceutical company. While the big established companies could have done everything in-house, they had to put together a series of partnerships – to supply the ingredients, license the technology, do the clinical trials and get all necessary approvals, and to manufacture the vaccine. Some partners, like the manufacturer, the Serum Institute of India Ltd (SIIL), were commercial companies. Others were public bodies. The US Food and Drug Administration licensed a conjugation method at negligible cost and supported transfer of the technology to the Indian company. Britain’s National Institute for Biological Standards and Control worked on the licensing. The clinical trials were done with national partners at eight study sites across Africa and India. The final product, MenAfriVac, has proved effective, safe even for infants, thermostable without refrigeration, and is now being produced in India for just 40c a dose. Although, in the end, the big multinational drug companies weren’t involved in producing the vaccine, they didn’t try to stop it, and the big companies that make up part of the board of the Vaccine Alliance, GAVI, supported the use of GAVI funds to pay for the mass vaccination programme.